A personal transportation device can be anything that gets a person around town, without a car. It could be the common, world-changing, bicycle, but we all know about those machines. 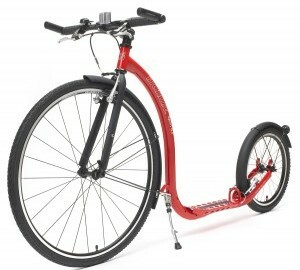 This article introduces a passion of mine, personal transportation devices that are not bicycles. In many of my scooter reviews and articles I have repeated over and over about how much I dislike the saddle and pedals that we rely on to use a bicycle, and have expressed my appreciation for human powered scooters. Of course walking, if you are able, is the simplest, least expensive, way to get from one place to another, but sometimes we need a little help for those distances that need not be covered in a car. Ignoring bicycles, that leaves scooters, skateboards, various types of skates, self-balancing vehicles etc. The easiest to use are the scooters. Not the folding, tiny-wheeled scooters that we all know, or their more finely-tuned pro-scoot offspring, but larger scooters that have air filled tires between 12.5 inches and 28 inches across. Despite the ease and pleasure of using such scooters, they are practically non-existent in places like the United States. When one is spotted on the street or bike path, every few years or so, it is assumed that some eccentric is just trying to be different. No-one seems to take the rare scooter seriously. The only place you may see them more frequently is in Pennsylvania Amish territory. Because a scooter is not a machine, riding one is not taboo for the Amish, and they manufacture some very good scooters. 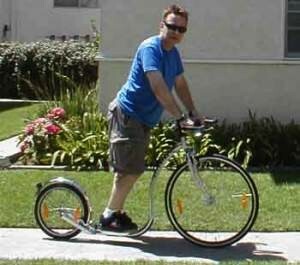 On the other hand, at time of writing, we see that many people are spending hundreds of dollars on two-wheeled self-balancing electric toys that can barely exceed walking speed, and are frankly, more trouble, bother and risk than simply standing up and walking. Why these things would be thousands of times more popular than a good scooter just makes no sense at all. Yesterday alone, I saw close to twenty being used in Beverly Hills, all at below a brisk walking speed. And then there are skateboards, and their sub-genre, the longboard. These are fine, but require a great deal of practice before they become reasonably safe. And with tiny wheels and no brakes, an accident is always around the next corner. Inline slates need to be be strapped on and taken off again, and seem to have fallen out of favor lately, but they are still commonly seen, despite the risk of a fall. So what is it about the human-powered scooter that conceals it’s potential? Why do people other than myself not look at them and see how perfect they actually are? When you ride a bike, your weight is on the pedals and on the saddle. Two very small points of flesh under your sit bones take the pressure of your weight and your legs propel you with very specific muscles. The rest of your body is barely used except for balance adjustment, which is done subconsciously. And if your handlebars are low in relation to your saddle, as they are in most bike styles, then your head is tilted back so you can look forward and see where you are going. This is a terrible position for the neck and the entire body. Yet every year, around the world, perhaps millions of bikes are purchased. In contrast, a large scooter or foot bike is propelled by most of the muscles of your body, dancing with gravity to convert up and down motion into forward motion. Do it right and nothing will hurt after the ride. People with back injuries can still use a scooter, with caution, to safely and slowly commute over a distance that would be difficult or impossible for them to walk, and in half the time. It seems today that every month a Kickstarter campaign is started for some ill-conceived personal transportation device. Usually it is an electric scooter that goes too fast for it’s tiny wheels, or another patent bending self-balancing “scooter” or powered skates. None of these ideas are practical. And all the while, there are the good scooters waiting to be bought and used. And waiting, and waiting. Of course you cannot trust that any available scooter will be good. Some have too much height at the footboard so the standing leg has to dip you down too far for a good push with the other foot. This can be very tiring. A low footboard is important and makes this non-machine much more efficient to ride. The height of the footboard is the most important consideration. Along with good tires and good bearings, it makes a huge difference to the riding experience. Some designers ignore this fact, with considerable stubbornness, and consequently many scooters are not as good as they could have been if they had only had a lower deck. But besides such design mistakes, it is possible to get a good scooter and discover the same passion that drives me to write all of these articles. Next time I ride, instead of seeing no other scooters, I want to see you. Yes you. We should be thinking about customizing Amish-built scooters. Where can I find a vehicle like the posted picture? My sister cannot sit at all–just stand or lie down. This would be life changing for her to get around.